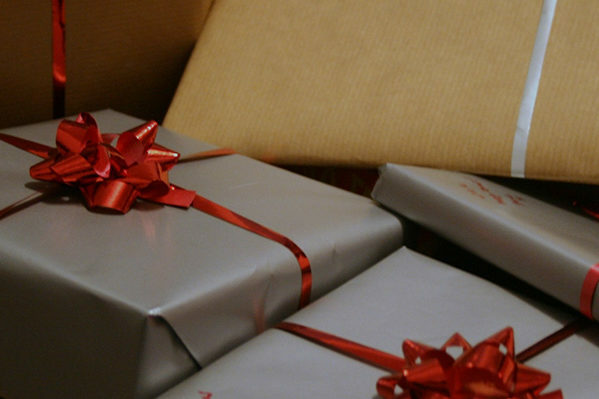 Holiday Shopping’s Biggest Winner So Far? Mobile. The holiday season is in full swing and one thing is clear—by and large, the winner of the season in Google Shopping so far this year, is mobile. 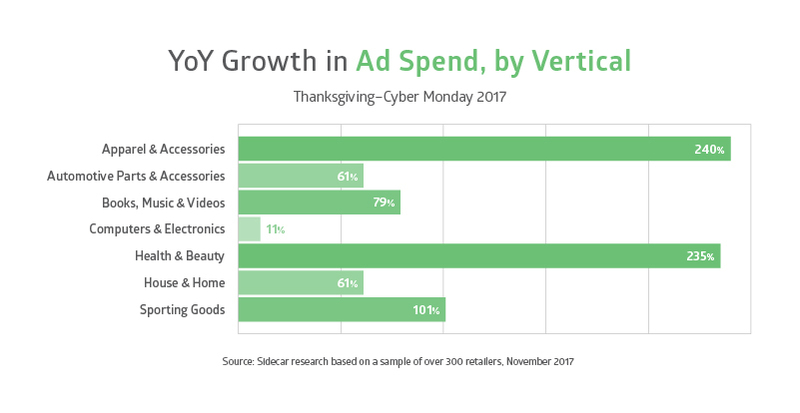 Riding the wave of strong growth in the channel over the last few years, retailers invested heavily between Thanksgiving and Cyber Monday—especially their mobile budgets, where spend increased by a whopping 139% over the same five-day period last year. That increased commitment to mobile ad spend paid off. According to our research into a sample of over 300 retailers ranging in size and vertical, mobile orders increased 90% and mobile revenue increased 96% YoY. Mobile wasn’t the only device segment seeing positive gains during the holiday shopping kickoff. While it did see significant growth, percentages were up across all Google Shopping YoY device performances. 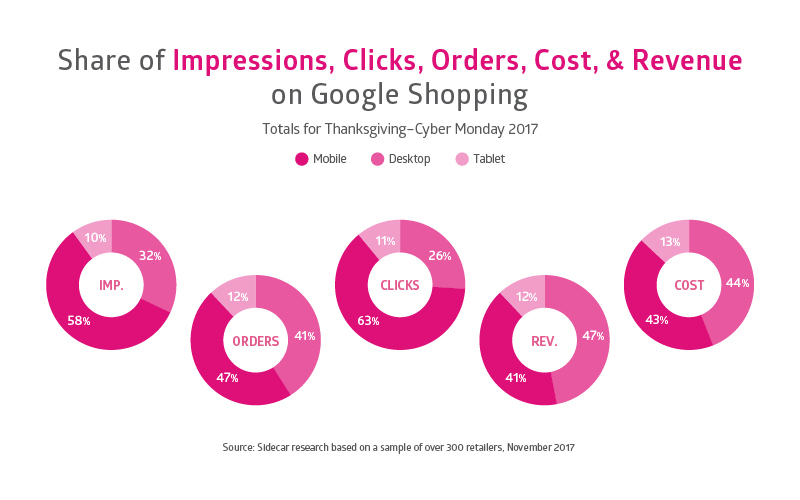 When looking at Google Shopping across the extended Thanksgiving weekend as a whole, mobile accounted for 58% of all impressions between Thanksgiving and Cyber Monday (49% in 2016), 63% of all clicks (57% in 2016), and 47% of all orders (41% in 2016). 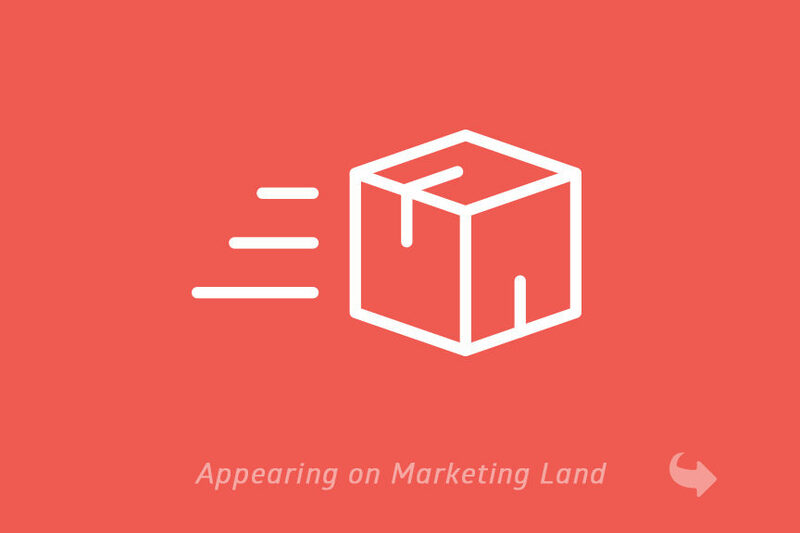 As we dove deeper into the data, the recurring theme day-to-day was again, mobile. Nearly every day saw YoY growth in all metrics across the board, with the exception being slightly lower AOV on Saturday and Cyber Monday. It’s worth noting the triple-digit impression growth across all days—mobile is garnering a significantly higher percentage of shoppers’ attention than in years past. Increased revenue and orders prove that trust in purchasing on mobile is gaining speed with shoppers. For the first time, mobile outpaced desktop in orders across the five-day period with 47% of orders attributed to mobile, and 41% belonging to desktop. Diving deeper again, when we break it down by industry, we saw increases in ad spend across all industries in our data set. Health & beauty and apparel & accessories stand out as two verticals banking on mobile with 240% and 235% YoY increases in ad spend. That bet paid off for both across impressions, revenue, and clicks. Given the established shift to mobile, it’s no surprise the segment performed well on Black Friday. According to our research, mobile drove 42% of Google Shopping revenue that day, an increase from 36% last year. 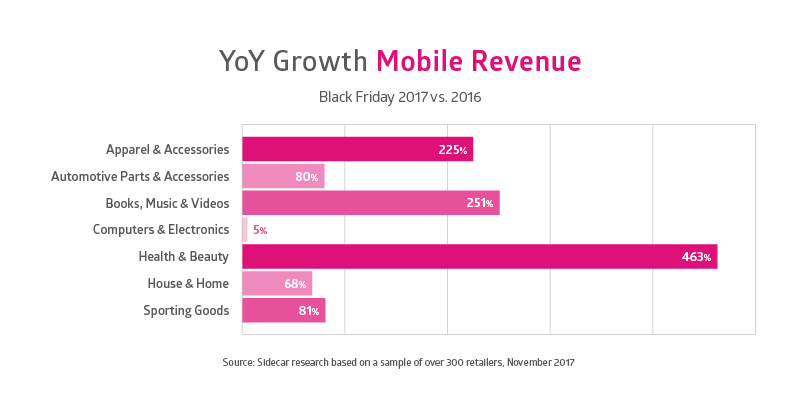 The impact of mobile was also evident when analyzing Black Friday revenue broken down by industry. Health & beauty was the biggest winner with a 463% increase in mobile revenue over 2016. Apparel & accessories and books & music also saw significant gains, with 225% and 251% increases YoY. Driving the increase in revenue was an increase in mobile conversions. Black Friday mobile conversion rates were 6% better than Cyber Monday, 15% better than Thanksgiving and 30% better than Saturday and Sunday. What’s more, it was the best day for the device in terms of impressions, clicks, revenue, and orders. In fact, it doubled desktop for clicks and nearly doubled for impressions. So, what does all this mean for a day that has traditionally signified an in-store experience? Are the days of chaos and crazy sale crowds drawing to a close? Not likely yet. But, it does highlight Black Friday as a day in flux—transitioning from an in-store experience to an online one. In fact, this year, Black Friday shoppers outspent Cyber Monday shoppers on mobile by 38%, up from 7% last year. According to ShopperTrak data, in-store traffic was relatively flat this year. So while shoppers are still heading out the day after Thanksgiving, the data shows they’re going mobile to purchase. Black Friday wasn’t the only stunner of the weekend. Perhaps the biggest surprise of the five-day period was Thanksgiving. Unlike last year, Thanksgiving was the growth leader among all days across all traffic- and demand-related metrics. It saw the largest increase in impressions, clicks, orders, and revenue. Much like everything else, it’s a mobile story. Mobile impressions were up 170% and clicks were up 122%, while desktop improved 70% and 64%, respectively. Those device-specific changes meant nearly two-thirds of all impressions came from mobile this year, up from 53% in 2016. Perhaps most intriguing is that Thanksgiving also managed to deliver more of the same in terms of efficiencies: It was again the strongest daily performer across average CPC, AOV, and ROAS. And that held true on all devices. 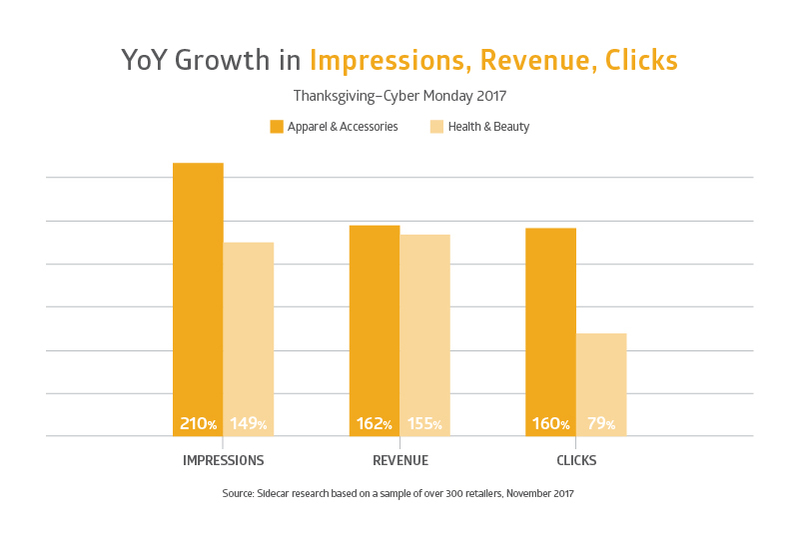 The biggest winners on Thanksgiving were apparel retailers: They saw a 230% in revenue and a 20% increase in conversion rate, year over year. Apparel retailers did it by increasing their Thanksgiving ad spend by 230%. But the trick, it appears, was radically altering the way they deployed their budget. Desktop spend by apparel retailers dropped 66% on Thanksgiving, while mobile and tablet spend increased 250%. Computers & electronics and health & beauty retailers saw triple-digit percentage growth in AOV. For a day that was dominated by mobile traffic, that’s a huge win. And other verticals, like automotive parts & accessories and house & home, bucked the trend and eked out improvements in ROAS, a difficult task given the increased competition in Google Shopping. 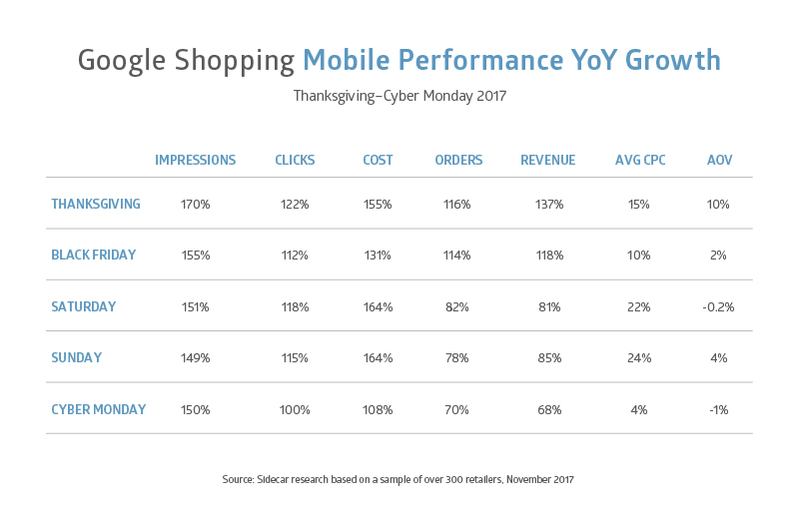 As we combed through the holiday shopping data, one thing became clear: To be relevant in Google Shopping during the holidays (and anytime for that matter), you have to be thinking mobile. Based on the data we’ve seen, retailers that hedge their bets on mobile are coming out on top. And we aren’t the only ones that feel that way. A recent batch of releases from Google shows they are continuing to evolve the Shopping channel to cater to the mobile format. The ability to purchase within Shopping ads through “Purchase on Google” recently hit iOS ads after launching on Android in 2015. The mobile experience is also updated with “Quick View,” an in-ad button that surfaces detailed product information. Knowledge panel updates and Showcase ads offer additional mobile-friendly views that surface more robust product-level information for the shopper on the go. With increased competition from other retailers and an increased reliance on mobile devices from consumers, growth in Google Shopping is no longer a given. 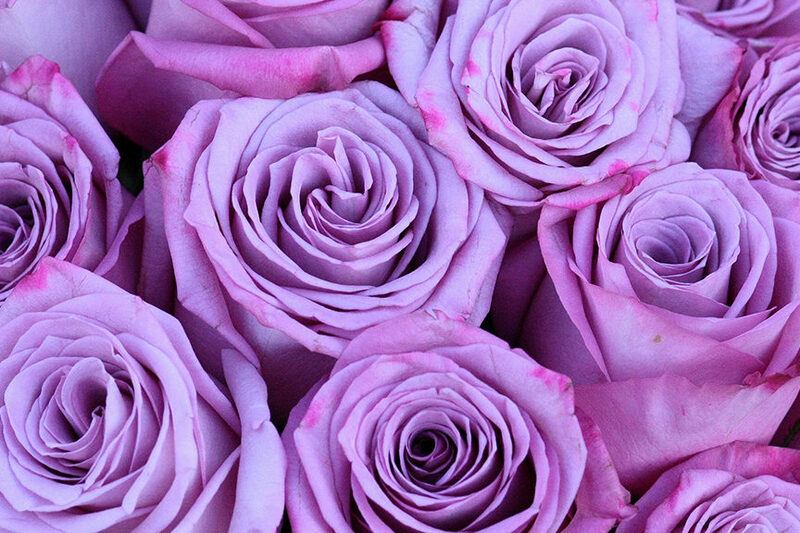 To have success, retailers need to look beyond simple optimizations. They ultimately need to understand more about how their customers are searching for products, how that changes between products, and, especially during a high-demand season like holiday, when they can best capitalize on that demand. Zack is a Manager, Solutions Analytics at Sidecar. He is an expert analyst, maintaining keen understanding of the retail landscape and recommending strategies to help marketers tailor their performance marketing campaigns to their business goals. Zack oversees a team of analysts at Sidecar and works closely with large retailers in driving campaign strategy and testing. 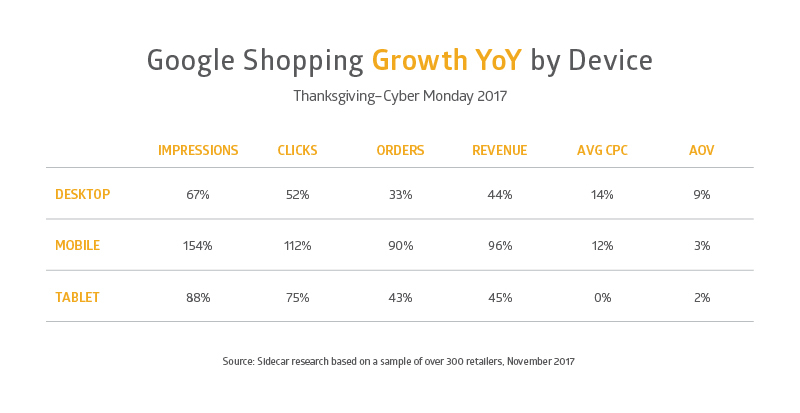 Thanksgiving to Cyber Monday: Which Day Won Google Shopping? 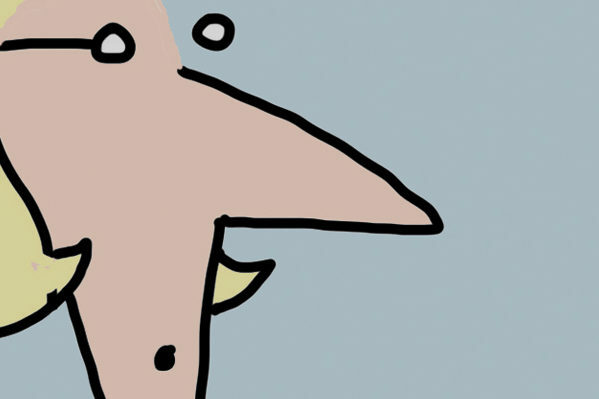 eTail Therapy for Surviving Holiday Part 3: Help, I Can’t Stop Looking at My Sales Numbers!